Did you know that the original name of the game was “Yacht”? According to the current owner, Hasbro, the game was invented by a wealthy Canadian couple that were playing the game on their yacht when traveling abroad. In 1956, the couple approached toy maker Edwin S. Lowe and asked him to make up a few samples of the game that were supposed to be gifted to their close friends. Lowe liked the game so much that he offered to buy the rights for the game. Later on, Lowe decided to change the name to Yahtzee. Today, Hasbro sells worldwide over 40 million Yahtzee games every year. Coming back to present day, Scopely, an LA-based game developer and publisher that was founded in 2011, released in 2012 Dice with Buddies. The game, released on iOS and Android devices, is a digital adaptation of the famous family board game, Yahtzee. The game has an important play mode that attracted millions to play, player vs player. They integrated Facebook in the game, thus enabling the users to connect and play with their friends. This way, Scopely was able to generate a significant community around the game. We had a very close collaboration with the client throughout the entire development phase of Yahtzee with Buddies. Daily calls were set up to ensure Hasbro feedback was addressed, development was on track and any risks were mitigated in a timely manner. 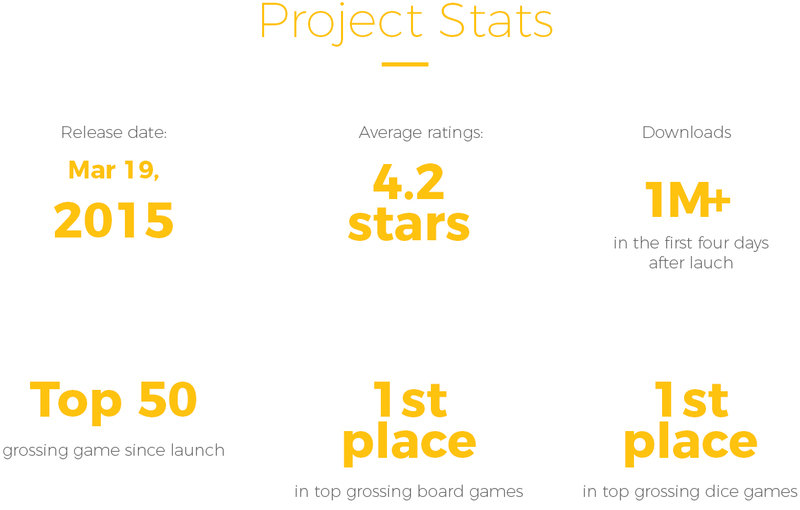 The technical challenge came from the fact that both games – Yahtzee with Buddies and Dice with Buddies – had to be built in the same project, on the same source code so any future development would enable the client to build immediately both games. Once the Yahtzee version of the game was launched it was an instant success. In conjunction with Scopely’s amazing live ops team, the title held its ground in the US top grossing charts. After the worldwide launch of the game, Amber was kept onboard as a co-developer, to augment Scopely’s internal development team. We worked on the next releases of both titles in 4-weeks sprints which intercalated with their internal development sprints thus ensuring updates were put out on the market every 2 weeks. The collaboration with Scopely was an amazing opportunity that helped us improve our services and thought us what delivery at the highest standards is.